As the most common causes of vertigo, not much is known about benign paroxysmal positional vertigo (BPPV), the condition that causes you to feel as if you're spinning or moving even if you may be standing completely still. Discover answers to your common questions about positional vertigo, including its causes and treatment options, so you can get back up and on your feet with stability today. Benign paroxysmal positional vertigo (BPPV) - or positional vertigo - is an inner ear disorder in which changes in the position of the head lead to abrupt vertigo, or a feeling that the room is spinning. The sensation can be mild or severe and last anywhere from a few seconds to several minutes. Positional vertigo usually occurs during instances in which you roll over or sit up in bed, look down, tip the head backwards, or experience a blow to the head. 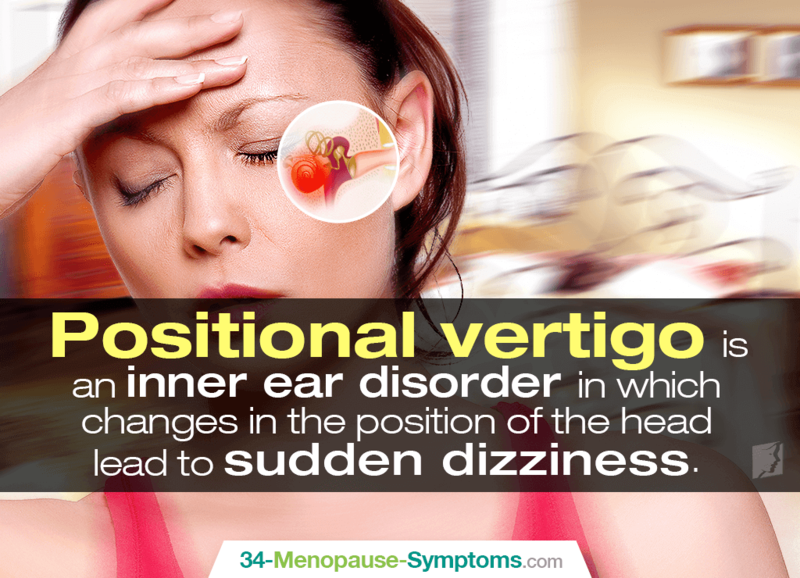 It is possible for postural vertigo to be accompanied by symptoms of nausea, lightheadedness, dizziness, vomiting, and a general sense of imbalance. BPPV happens when calcium carbonate crystals, called otoconia, move and get trapped within organs of the inner ear that control balance. When the head changes position, the crystals roll around and push on tiny hairs that give the brain information about balance, causing paroxysmal positional vertigo. Research is still being undergone, but there is believed to be a connection between menopause and dizziness as sudden drops in estrogen weaken the otoconia, causing them to fall and interfere with balance. As the transition out of reproductive years is characterized by drastic hormonal fluctuations, this signifies that menopausal BPPV can be recurring. On the other hand, other causes of positional dizziness include injury, age, or infection. How Do I Treat Positional Vertigo? Unfortunately, there is no cure for BPPV. However, the condition can be managed with home treatments and proper measures taken to treat the underlying cause of hormonal imbalance in menopausal women. Simple lifestyle changes favoring endocrine system health include improving your diet to contain phytoestrogenic foods - soy, beans, nuts, dark leafy greens, etc. - as well as avoiding habits that trigger dizziness for those that favor balance, such as sitting down immediately when positional dizziness overtakes you, using appropriate lighting when getting out of bed at night, or using something for stability if you're at risk of falling. Also, the use of alternative medicines to nourish the endocrine system will help reduce symptoms of hormonal imbalance throughout the menopausal transition. These include phytoestrogenic supplements - black cohosh, red cover, St. John's Wort, etc. - as well as hormone-regulating supplements, like Macafem. Further dizziness treatments may also prove effective when acted upon quickly and efficiently. General positional vertigo treatment is done by a series of maneuvers that change the position of the head and body in order to shift the otoconia out of the organs of the inner ear and back into their proper location. This procedure is called the canalith repositioning procedure. After performing the particle repositioning procedure with you once, your doctor will teach you how to do it at home. This will be especially beneficial for menopausal women suffering from recurring BPPV. Benign paroxysmal positional vertigo (BPPV), commonly known as positional vertigo, is the most common form of vertigo. It is an inner ear condition that causes you to feel an intense sense of spinning or moving with even the slightest movement. Although caused by injury, infection, and age, this condition is also symptom of the hormonal fluctuations that are characteristic of the menopausal transition. There is no cure for BPPV, but it can be managed during menopause by treating the underlying cause and by practicing the canalith repositioning procedure. Furman, J.M. & Lempert, T. (Eds.). (2016). Neuro-Otology, Volume 137, 3rd Series. Netherlands: Elsevier. Available from Google Books. Though it may seem self-explanatory, some things such as vertigo, nausea, lightheadednss, and loss of balance are often felt during a dizzy spell. This article explains more about the causes and whether you should be concerned about dizziness and weakness. Coming to an accurate diagnosis for vertigo and dizziness can be tricky – learn more to better understand these troublesome symptoms.